Henryk Wieniawski occupies a special place in the history of violin-playing. First and foremost as a brilliant virtuoso whom contemporary critics and music-lovers regarded as the re-incarnation of Nicolò Paganini. Second, as a composer whose works have stood the test of time and have featured prominently in the literature of the violin and in the repertoire of many leading violinists. Third, as a teacher at two of Europe’s celebrated music academies. Finally as an exciting and flamboyant personality. Henryk Wieniawski was born in Lublin1 on 10 July 1835 into a family who combined an interest in social welfare with a passion for music. Henryk’s father, Tadeusz, held a Master’s degree in philosophy, medicine and surgery, and had an extensive medical practice. In 1830, at the hour of Poland’s need, Tadeusz Wieniawski had played an active part in the Uprising against the Russian invader. Henryk’s mother, Regina, was the daughter of Józef Wolff, a Warsaw doctor and patron of the arts. She had studied the piano in Paris and subsequently brought her musical interests into the home. Music became an integral part of the upbringing of the Wieniawski children, who went on to make a fine contribution to Polish culture. Henryk’s elder brother Julian was a man of many talents: an economist, a writer and a piano-player. Henryk also had younger twin brothers: Józef and Aleksander. Józef became one of Europe’s finest pianists as well as a composer, teacher and promotor of Polish music. Although a promising singer, Aleksander chose instead to follow a career in the civil service. The three youngest of the Wieniawski children – Adam, Kajetan and Konrad – died in their first year. The oldest child in the family was Henryk’s half-brother from Tadeusz Wieniawski’s first marriage to Ewa Feder (alias Lanckorońska). The boy took his father’s name and followed his father into the medical profession. The Wieniawski home was steeped in piano music, particularly the music of Chopin, yet Henryk chose not to become a pianist like his mother. Maybe it was the many distinguished violinists who visited Mme Regina’s salon, maybe the wandering musicians or maybe Henryk’s fascination with the park orchestra that prompted him to develop an interest in the violin rather than the piano. When he was five, Henryk was initiated into the secrets of the violin by Jan Hornziel, who was an experienced musician and teacher and a former pupil of Louis Spohr. When Hornziel left Lublin to become Konzertmeister at the Teatr Wielki (The Grand Theatre)2 in Warsaw, Henryk transferred to Stanisław Serwaczyński – another famous Lublin violin teacher, who also taught Henryk’s older colleague Joseph Joachim. Henryk made amazing progress on the violin and gave his first solo public appearance at the age of seven. His career now necessitated systematic study but this was impossible in Poland at that time as the country was torn apart by the Partitions. It is no accident that the leading exponents of Polish culture found themselves in exile, primarily in France. In the autumn of 1843 eight-year old Henryk, accompanied by his mother arrived in France with the intention of studying at Europe’s premier music school: the Paris Conservatoire. Unfortunately, the college’s statutes appeared to present an insurmountable barrier: the Conservatoire only accepted pupils aged twelve years and over, and even then only French nationals. Strenuous efforts were made on Henryk’s behalf and he was granted an exception. On 28 November 1843 Wieniawski was enrolled by special decree as number 468 on the pupils’ register at the Conservatoire. He was officially listed in the class of Joseph Lambert Massart, the distinguished professor; but to begin with Henryk remained under the care of Massart’s assistant, J. Clavel, moving up into the professor’s masterclass a year later. ‘Le petit Polonais’, as he became known, proved himself an exceptional pupil and Massart therefore gave him a great deal of extra attention. At the end of 1845 Daniel Auber, the Director of the Conservatoire, wrote the following report, signed by the other teachers: „Our highest hopes in Mr Massart’s special violin class […] rest in young Wieniawski, aged 10 years and 4 months”3. These hopes came to fruition several months later when Henryk decided at the very last minute to enter for the Conservatoire’s final, competitive examination along with his much older colleagues. Henryk was declared the outright winner and thereby the youngest graduate in the Conservatoire’s history. He was only eleven years old, in his third year of study, and theoretically still ineligible to begin his Paris studies. Henryk remained a further two years in Paris perfecting his violin technique with Professor Massart. The boy was no longer alone in the capital since his mother had arrived from Lublin, this time bringing her highly talented younger son Józef, who was about to begin his pianoforte studies at the same Conservatoire. She rented a small appartment and created a homely environment for the two boys. Just as in Lublin, Regina’s small Parisian salon was filled with the sound of music. She often entertained her brother, Edward Wolff (a pianist and respected professor at the Paris Conservatoire) and his friends as well as various Polish émigrés, including Adam Mickiewicz.4 Mme Regina’s eldest son, Julian, described these gatherings: „Over several years Mother’s modest salon gathered together important figures from the world of music and art for ‘thé’, a drink at that time little known by the French. Occasionally our greatest bard, Adam [Mickiewicz], a passionate music-lover, honoured us with his presence The author of Dziady Forefather’s Eve would listen for hours on end to my brothers’ playing and he particularly enjoyed any music with a Polish theme. With his hands on his knees, his fine head buried in his palms and tears in his eyes Adam would recite a few verses from one of his masterpieces evoked by the sound of familiar Polish melodies”5. Henryk had already met Fryderyk Chopin in Paris and these encounters with the gods of Polish culture cannot have failed to have left a strong impression on the young musician’s sensitive nature. Meanwhile, Henryk set about making his name as a concert-violinist. The eleven to twelve year-old’s astonishingly mature playing, as well as his first attempts at composition, met with general acclaim. This is the period of the Aria and Variations in E major, the Caprice, the 12 Etudes for violin solo, the three Romances, a Violin Concerto in D major, the Grand Caprice fantastique, the Allegro de sonate. The majority of these pieces are lost and some are known only from concert reviews and fragmentary notes in dedications. Today, for example, we know the Violin Concerto in D major only as a fragment written as a dedication in an album belonging to Stanisław Moniuszko6. The absence of any account of Wieniawski’s performance of this concerto suggests that the piece was never more than an incomplete sketch. Two of Wieniawski’s earliest compositions have survived intact and show evidence of their author’s extraordinary talent. These are the Grand caprice fantastique op. 1 and the Allegro de sonate op. 2 which were published in Leipzig and Paris. As well as his own compositions, Wieniawski’s repertoire at this time comprised Violin concertos by G. B. Viotti (nos. 17 and 20), Ch. de Bériot (nos. 2, 4 and 5), R. Kreutzer (no. 19) P. and Rode (no. 7) as well as pieces for solo violin and piano by A. Artôt, H. W. Ernst, Bériot, Kreutzer, J. Haydn and duos by Henryk’s uncle, Edward Wolff (written in conjunction with Bériot and Ch. Vieuxtemps). On 30 January 1848 Henryk gave a recital in the Sax concert-hall with his brother Józef and his uncle, Edward Wolff, and then bade farewell to Paris for a whole year. Escorted by his mother, he set off on his first foreign concert tour. Henryk was a subject and scholarship-holder of the Tsar of Russia7 and it was now time to show some proof of his achievements. At the end of March, after a short stay with his family in Warsaw, Henryk arrived in St. Petersburg, utterly exhausted. His appearances at the Tsar’s court were met with great acclaim. In April and at the beginning of May he gave five enthusiastically received public concerts, after one of which the famous Belgian violinist Henri Vieuxtemps commented: „There is no doubt that this child is a genius, for at his age it would otherwise be impossible for him to play with such passionate feeling, and moreover with such understanding and such a well conceived plan”8. Henryk became the darling of the St. Petersburg élite and was received in the salons of aristocrats and patrons of the arts where he often gave improvised concerts with his hosts. He played, for example, at the home of the celebrated cellist Count Mateusz Wielhorski and of the violinist Prince Nikolai Yusupov, to whom Henryk dedicated (amongst other pieces) the Rondo russe de concert, which he had composed in St. Petersburg and which proved to be the first version of the Rondo élégant op. 9. In St. Petersburg Wieniawski also composed the Rondo alla Polacca, of which the well-known composer and conductor Wiktor Każyński wrote: „I have to admit that it did cross my mind that maybe a Parisian musician had a hand in this score but Henryk’s inestimable mother assured me that the Rondo had been written the previous night in St. Petersburg”9. This composition, like the Tarantella (a fragment of which was inscribed in a dedication to the young pianist Julia Grunberg) is missing. After a successful three-month stay in St. Petersburg, Wieniawski and his mother set off for the Baltic states, full of impressions, stopping briefly in Helsinki, Revel, Dorpat, Riga, Mitava and Ploen. In Ploen they stayed a while with Baroness Angelica de Roenne, giving concerts in the homes of the Baroness’s friends. Whilst in Ploen Wieniawski wrote a Nocturne for solo violin and dedicated it to the Baroness de Roenne; only a fragment of the piece has survived. In the autumn of 1848, on his way to Warsaw, Wieniawski stopped briefly in Vilnius where he had his first meeting with Stanisław Moniuszko. On 10 and 15 October the hall of the Warsaw Teatr Wielki was filled to overflowing and Henryk’s début performances in the capital were greeted with great ovations. A reviewer from the „Kurier Warszawski” („The Warsaw Courier”) wrote: „Spring freshness, strength, skill and the profound emotional feeling of a mature adult vie for supremacy in his amazing playing”10. A few days spent on his home ground, giving concerts in Lublin amongst other places, preceded the next stage of the concert-tour whose destination was Dresden. Here Henryk spent close on four months as a guest of Karol Lipiński, the Nestor of Polish violin-playing11. Lipiński shared his vast experience of performance and composition with his young compatriot and revealed the secrets of the playing of other maestros, especially that of Paganini – whose legend fascinated Henryk. Lipiński and Wieniawski played a great deal of music together and Lipiński vigorously promoted his young guest’s career. Wieniawski gave two concerts in Dresden, and then set off to perform in Wrocław and Leipzig. He then travelled to Weimar armed with a letter of introduction from Lipiński to Franz Liszt. Under the patronage of the famous Hungarian pianist Wieniawski appeared twice in Weimar. So ended the young artist’s first concert-tour. Passing through Berlin and Hamburg (where he gave a concert) Henryk made his way back to Paris. The tour had been extremely valuable to Wieniawski in that it enriched his artistic experience and enabled him to make contact with many prominent artists. The huge audiences who had packed his concerts in the various countries had given Wieniawski a chance to taste success. However, he also had confirmed the areas in which his musicianship was still weak. Wieniawski composed gladly but he knew that his compositions to date were the product of an astonishing intuition and instinct; he now needed to acquire a solid theoretical grounding and a more detailed knowledge of the composer’s craft. With this goal in mind he returned to Paris, where on 11 April 1849 his name reappeared on the register of pupils at the Conservatoire, this time in the composition class of Hippolite Collet. Henryk’s brother, Józef, who had just very successfully completed his piano studies began composition studies at the same time. The studies did not last long and in June-July 1850 both brothers passed their final exams. While still students, the Wieniawski brothers gave various joint concerts in Paris which met with the delight of audiences and critics alike. Their expanded repertoire included K. Lipiński’s Vidiu Concerto, a so called militaire concerto; N. Paganini’s Andante and The Carnival of Venice; Variations by H. H. Ernst and Wieniawski; J. S. Bach’s Fugue from the Partita in G minor; Vieuxtemps’ Airs variés; E. Bellini’s arrangement of a Fantasia from Il pirata; Ernst’s version of G. Rossini’s Ottello and various pieces by A. Artôt. The brothers also played some of their own compositions, including those written in their final year at the Conservatoire. The Polonaise in D major op. 4, the most ambitious of Henryk’s student-works, received its final touches. Two lost compositions date from this period: the Village Mazur, and a Duo concertant composed by both brothers on themes from G. Donizetti’s Lucia di Lammermoor. There was also a recently discovered joint composition: a Grand Duo on the Russian National Anthem by A. Lvov, dedicated to the well-known patroness of young artists, Empress Alexandra Fyodorovna, wife of Tsar Nicholas I. A possible motive for this dedication was the Wieniawski brothers’ plan to make a grand concert-tour of the Russian Empire – a rarely granted privilege. The Empress’s reception of the brother’s dedication in November 1850 in Warsaw, gave them the chance to realize their ambition. In September 1850 the Wieniawski brothers were bid farewell by their friends and set forth from Paris. Hector Berlioz wrote of this departure: „We are losing one of the greatest violinists that the Paris Conservatoire has ever produced. Henryk Wieniawski is leaving for Russia. This young man, for too long regarded as a child wonder, possesses an unequalled, serious and complete talent. What is more, he composes beautiful pieces for his instrument […]. He is sure to enjoy deserved success in St. Petersburg”12. On their way to Russia the Wieniawski brothers stopped off in the Polish capital where they spent the months up to December (when the Warsaw public concerts were due to begin) in the salons of the capital. On 9 October they had the rare privilege of playing in the Pałac Łazienkowski (Łazienki Palace)13 to the Empress of Russia who was visiting Poland. On this occasion the brothers’ performance included the piece that they had dedicated to the Empress; the duo on themes from the Russian national anthem. In November the brothers were invited to play for the citizens of Kalisz and environs and they then appeared in Radom. Finally, on 16 and 23 December came the concerts in the Teatr Wielki, and on 2 January 1851 a concert in the Resursa Nowa (New Social Club)14. Three days later the brothers appeared in Lublin. The reception of the young artists by their Polish compatriots was extremely warm, with no end to ovations and adulation. An extremely arduous task now awaited Henryk and Józef; a mammoth, two-year tour of the boundless territories of Russia and the Baltic lands. This was a tour given while the brothers were barely out of childhood: Henryk was just 15 and Józef still only 13. Together they gave close on 200 concerts in huge cities as well as provincial towns, everywhere delighting the audiences and critics, although some reviews did express fears that Henryk’s precocious success might prove detrimental to his future career. The St. Petersburg correspondent of the Rheinische Musikzeitung concluded: „Henryk Wieniawski is now at a transitional stage of his life; no longer a child but not yet a man. This is the age at which a person’s character is formed and this is what determines an artist’s future. Since Henryk has so happily made the change from child-wonder to superb virtuoso I trust that the Muses will continue to succour him as he makes the transition from virtuoso to true artist”15. The majority of the reviews spoke of Henryk’s great promise, including a review by Stanisław Moniuszko who had followed the development of the Wieniawski brothers with great interest during their concerts in Vilnius in May 1851 and May 1852. One is amazed by the extraordinary amount of composition that Henryk Wieniawski managed to complete during his concert-tour of 1851-1852. Despite a crowded concert calendar and constant travel to far-flung places he still found time to write. This was in fact the most fruitful compositional period of his life, during which he produced the Adagio élégiaque op. 5; the concert fantasia Souvenir de Moscou op. 6; the Capriccio-Valse op. 7; the Grand duo polonaise (coritten jointly by the brothers); the Romance sans paroles and Rondo élégant op. 9; and Le carnaval russe op. 11. In Russia Wieniawski began work on his first violin concerto. Several other compositions from this period are lost and are only known from reviews or from fragments of score written as dedications into albums. These include the following pieces composed in Vilnius: a Unbridled March and the Souvenir de Vilnius, a piece based on themes from André-Ernest-Modeste Grétry’s opera Richard coeur de lion, and a duo on Finnish themes (written in Helsinki in collaboration with Józef Wieniawski). After the labours of the mammoth tour, Henryk spent a few days resting in his home town of Lublin then at the end of January 1853 travelled to Warsaw to prepare for the next round of travels. On 20 February the Warsaw press reproached the Wieniawski brothers for not having performed in the capital then reluctantly bade them farewell on their way to Vienna. Here the brothers gave eight concerts, including one at the Vienna Opera attended by the emperor, his family and court. In Vienna Henryk gave the first performance of one of his most popular miniatures – the Kujawiak16 – and also his Variations on the Austrian National Anthem, a piece which later became part of the collection of Caprices op. 10. From Vienna the Wieniawski brothers travelled to Cracow for three concerts, then proceeded via Leipzig to Weimar where, according to the „Dziennik Warszawski” („Warsaw Daily”) „they experienced at the Grand Prince’s court the kind of welcome that every first rate intellectual can always expect in Weimar”.17 Both brothers were now guests of the famous pianist Franz Liszt, as Henryk had been four years earlier. Józef perfected his virtuoso technique under Liszt’s guidance; Henryk played at the celebrated gatherings of famous musicians in Liszt’s Villa Altenberg and with Liszt at court and public concerts. In July 1853 the Wieniawski brothers played in the Czech health-resorts of Karlovy Vary and Mariánské Lázně before interrupting their tour of this part of Europe to take up an unexpected and exciting invitation to perform in Moscow. They then continued to tour various German health-resorts. After five concerts in Aix-la-Chapelle they reached Leipzig. Here, in the Gewandhaus on 27 October 1853 the premiere of Henryk’s recently completed and still unpublished First Violin Concerto in F sharp minor op. 14 took place, with a critic from the „Signale für die Musikalische Welt” reporting that „the audience was electrified and your reporter with them”18. The turn of 1854 saw a series of triumphal appearances in Bavaria, beginning with concerts in Munich. After one of these performances Franz Lachner, a well-known Bavarian composer, director and musical authority wrote: „Critics have hesitated before comparing, or even contemplating comparing any superior violin virtuoso with Paganini, that maestro of consummate technique. But Mr Henryk Wieniawski has forced me to declare that the noble style of his technique, right through to his ‘devilish leaps’, not only equals that of the blessed Paganini, but is sometimes even more brilliant”19. In February 1854, after several concerts in Frankfurt-am-Main, the Wieniawski brothers arrived in Berlin where, despite strong competition from other leading European musicians in the city (including Henri Vieuxtemps), they gave 16 concerts at the Royal Court, the Schauspielhaus, the Kroll Theatre and the Berlin Opera, thus establishing their fame as artists of the highest rank. In April 1854 the brothers arrived in Poznań to give three concerts, and then, after appearances in Königsberg, Gdańsk, Elbląg and Bydgoszcz they returned to Poznań for a further eight concerts. These appearances in Poznań had an extra-musical dimension. The inhabitants ofthis city were being subjected to Germanization20, and therefore welcomed the young Polish artists, now bathed in European glory, with the greatest deference, transforming their concerts into patriotic manifestations and enthusiastically receiving the brothers outside the concert hall. Henryk’s expressions of gratitude for the hospitality shown in Poznań are noteworthy. A Mazurek which he must have written before arriving in the city was re-titled Souvenir de Posen (op. 3) and dedicated to Joanna Niemojowska. Henryk dedicated his Kujawiak to another lady from this region: Michalina Czapska. In Poznań Henryk wrote his one and only composition for voice and piano – the song Rozumiem (I Understand) to lyrics by the poet Józef Dionizy Minasowicz21. He dedicated the song to Ludwika Turno, with whom he had a fleeting romance. Finally in Poznań, Henryk Wieniawski completed one of the most important pieces of his whole oeuvre – the set of Caprices entitled L’Ecole moderne op. 10. Wieniawski’s cadenza to the first movement of L. v. Beethoven’s Violin Concerto and the piece entitled Theme original varié op. 15 also date from this period. From Poznań the Wieniawski brothers went on to give concerts in Munich and Frankfurt. Then with appearances in the German spa-towns, and in Heidelberg, Würzburg and Cologne they completed their second grand tour which comprised 122 concerts and confirmed the highest rank on the young artists in this part of Europe. It was at this stage that Henryk introduced several important violin works into his repertoire: L. v. Beethoven’s Concerto in D major; F. Mendelssohn’s Concerto in E minor; Beethoven’s Kreutzer Sonata; J. S. Bach’s Sonata in A minor; Di tanti palpiti from G. Rossini opera Tancerdi , arranged by N. Paganini’s. The brothers were now faced with new engagements in cities and countries that they had not previously visited. At the end of December 1855 the Director of the Brussels Conservatoire – François Joseph Fétis – invited them to perform in the Belgian capital. The Conservatoire’s 2,000-seat hall proved too small to accomodate everyone who wanted to hear the Polish artists. The brothers performed to similar acclaim in the hall of the Theatre Royal, the Artistic and Literary Circle, and also in Antwerp and other Belgian cities. From here they went on to give concerts in Hamburg, Bremen, and Hannover. 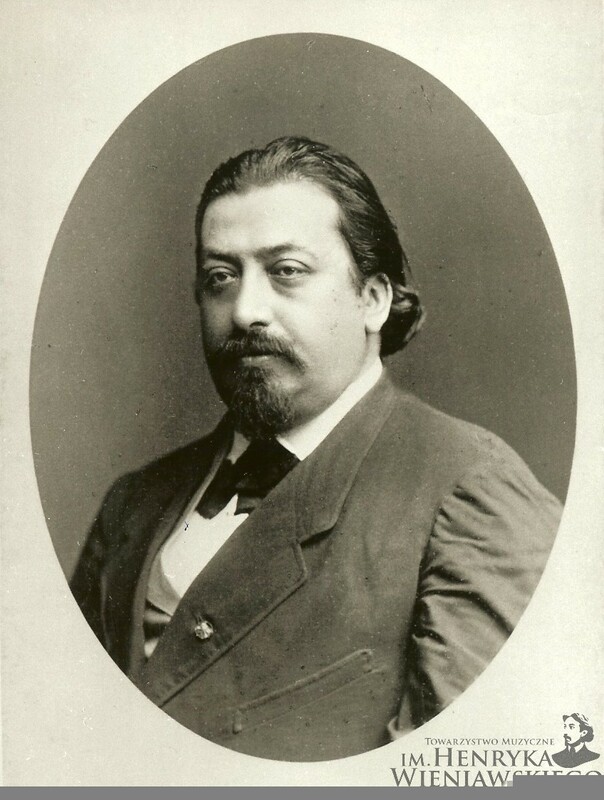 The violinist Joseph Joachim was at that time the Germans’ favourite violinist in Hannover, and after one of Henryk’s concerts in this city a reviewer wrote: „Wieniawski is no longer a rival worthy of Joachim; Joachim is now the only violinist whose name can stand comparison with Wieniawski”22. In the spring of 1855 the two brothers made brief appearances in Paris, where Henryk had the opportunity to present and dedicate his most recent piece (and incidentally one of his most effective compositions) – the Scherzo-Tarantelle op. 16 – to Professor Massart, his old teacher. The experiences of the recent concert tours had demonstrated that the brothers’ individual personalities were too strong for them to continue to give joint concerts. Henryk was hogging the limelight while Józef was being kept in the shade. Various critics had already noticed it and predicted the brothers’ musical separation. The decision to go their separate ways was taken in the summer of 1855 during a visit to their home town of Lublin. It was a separation brought about by common sense, not antagonism, and the brothers continued from time to time to play concerts together. They gave farewell joint appearances in Lublin and Kiev, then in August Henryk went alone to Szczawno-Zdrój23 for a rest-cure, plus a spot of concert-giving. He appeared twice in Wrocław, and at the end of the year played in various German towns, among them Leipzig, Dresden and Cologne. At the beginning of 1856 Henryk returned to Belgium to play in Brussels, Antwerp and Ghent. March saw the start of Wieniawski’s long and close association with the Netherlands. After a series of a dozen or so concerts in Amsterdam, the Hague and Utrecht as well as in numerous Dutch towns, he gave a series of concerts in Belgium. In the summer he appeared in Königsberg and the German spa-towns, and then in the autumn he returned to play for the Dutch music-lovers who held him in high regard. Here in the Hague, in 1856, the musicologist A. Desfossez published the first biography of the 21 year-old Polish musician. The author took the motto for his book from a review in the Brussels’ journal „L’Indépendance”: „No violinist can match Wieniawski as regards mastery of technique; a virtuoso of this rank has not appeared since Paganini”24. In the spring of 1857 Wieniawski returned to Poland and gave the music-lovers of Lvov their first opportunity to hear him. For the first time since the brothers’ musical separation Henryk was accompanied on the piano by Józef. The brothers had planned to give only three concerts but their enthusiastic reception impelled them to give five more. After three concerts in Cracow they went their separate ways again. Henryk gave a concert in Kalisz, then appeared five times in Köigsberg and on 13 June began his third visit (this time of three weeks) to Poznań, where he gave five concerts including a benefit recital with the pianist Princess Marcelina Czartoryska. Henryk took a few weeks’ holiday in Szczawno-Zdrój (where, as during his previous visit, he gave two concerts). This was followed by a holiday in the south of France. He then formed a partnership with two Italian artists: the singer signora Fiorentini, and the double-bass player Giovanni Bottesini. The three musicians made very successful appearances in Frankfurt-am-Main, Berlin (7 concerts), Hamburg, Amsterdam, the Hague, Utrecht and Dordrecht. The double-bass and violin duos in particular caused a sensation. Wieniawski then performed in numerous Dutch towns, then in Belgium (Brussels, Antwerp, Namur) and in April 1858 he arrived in Paris to give a dozen or so concerts. He spent the summer months in now traditional fashion at various health-resorts on the Rhine. In October he visited Weimar and gave concerts in Dresden. At the end of October 1858 Wieniawski travelled to London, thus opening up an important new chapter in both his professional and his personal life. He was invited by a well-known impressario, the composer and conductor Louis Antoine Jullien, to participate in the 20th annual series of concerts at the Royal Lyceum Theatre. In the course of seven weeks Henryk took part in 40 concerts – six concerts a week – during which time he met with the continuous enthusiastic approval of the London concert-goers, who according to the weekly „Musical World” stormed the theatre box-office day and night for tickets. The London series was followed by concerts with Jullien’s ensemble in other English, Scottish, and Irish cities. Henryk Wieniawski made an exceptional contribution to London’s chamber music and his playing was very popular and much admired. In February 1859 he was invited to the first desk of the newly inaugurated cycle of Monday Popular Concerts, to which he remained faithful whenever he was in London. He also played regularly in the matinées of The Musical Union. A third musical organization fostering chamber music in London was the Beethoven Quartet Society in which Wieniawski played alongside the finest musicians of the day: Heinrich Wilhelm Ernst, Joseph Joachim and Alfred Piatti. Joachim recalled that „[Wieniawski] has always been and still is the craziest risk-taking virtuoso I’ve ever heard. Anyone who failed to witness the daring acrobatic leaps that he performed on the viola when we played as a quartet with Ernst and Piatti in the London Beethoven Quartet Society cannot begin to imagine the feats his left hand can perform”25. Looking through the programmes of the chamber concerts organized by these three London societies one is startled by the line-up of leading artists from every corner of Europe and amazed by the depth and breadth of the repertoire contributed by the Polish virtuoso. The programmes frequently contained works by L. v. Beethoven, including the Piano Trios: in B flat major op. 97, C minor op. 1 no. 3, G major op. 1 no. 2, E flat major op. 70 no. 2; the String Quartets: in F major and E minor op. 59 nos. 1 & 2, C minor op. 18 no. 4, E flat major op. 74, G major op. 18 no. 2, E flat major op. 127, B flat major op. 130, F major op. 135; the String Quintet in C major op. 129 and the Septet in E flat major op. 20. The chamber-music of F. Mendelssohn-Bartholdy heard in these concerts consisted primarily of the Piano Trios: in D minor op. 49 and C minor op. 66; the String Quartets: in D major and E minor op. 44 nos. 1 and 2; the String Quintet in B flat major op. 87 and the String Octet in E flat op. 20. W. A. Mozart was represented in these programmes by String Quartets: in G and C major and Quintets in D major and G minor; J. Haydn by the Piano Trio in G major and Quartets: in D major and G major; R. Schumann by the String Quartets: in A minor op. 41 no. 1 and E flat major op. 47, plus the Quintet in F major op. 14. L. Spohr was represented by the String Quartet in G major op. 146 and the double Quartet in E minor op. 87 no. 3 – to mention just the most important items. During these years in London the rest of Wieniawski’s concert repertoire also expanded greatly and came to include J. S. Bach’s Violin Concerto in D minor BWV 1052 and G. B. Viotti’s Concerto no. 22. New Sonatas in Henryk’s repertoire included L. v. Beethoven’s in C minor and G major op. 30 nos. 2 & 3 plus the C minor op. 111, W. A. Mozart’s in F major KV 376 and in G major op. 69; Beethoven’s Romances in F major and G major; L. Spohr’s Duo concertant for two violins; F. Schubert’s Rondeau brillant op. 7; H. Vieuxtemp’s Rondino; D. J. Allard’s Duos. Wieniawski remained in London until June before setting off to perform – as he did most years – in the health-resorts of Baden-Baden, Ems, Bad Homburg and Ostend. He then gave concerts ‘en route’ in Dover and Brighton before returning to London. It was during this period that the artist’s personal future was decided. In London, back in April, Henryk’s friend Anton Rubinstein had introduced him to the Hampton family and Henryk had met their daughter, Isabella. The two young people fell deeply in love. Isabella’s mother Elizabeth, met who was the sister of the well-known pianist and composer George Osborne, looked sympathetically upon the affair but Isabella’s father (who had respect for musicians but knew a thing or two about them) was opposed to the match and wanted his daughter to marry a man with a more solid financial background. History has it that Mr Hampton’s resistance to the marriage was broken when he heard the Légende that Henryk had written under Isabella’s spell. But the truth is more prosaic. Mr Hampton was eventually persuaded by his wife and daughter to allow the marriage to take place but consented on the strict condition that Wieniawski take out a life-assurance policy for the considerable sum of 200,000 francs and settle down to married life. Anyway, in November 1859 Wieniawski wrote to his Brussels impressario: „I don’t know whether you have heard that I wish to marry a young English woman whom I love more deeply than the finest Stradivarius or Guarneri”26. Wieniawski concluded his London engagements at the Drury Lane Theatre and set out for the continent. Here he gave concerts in Amsterdam as well as in other Dutch cities, then he stopped in Brussels and Paris before arriving in Bordeaux for three more concerts. In March he set off for St. Petersburg to fulfil the second condition laid down by his future father-in-law: the settling down to married life. In St. Petersburg Wieniawski gave several concerts, all of which were received with the greatest acclaim. A music critic compared Wieniawski’s playing to Paganini’s and named him the rightful successor to the greatest ever master of the violin. „We hope that Wieniawski will stay with us in St. Petersburg for it would be a shame if Russia were to allow this artist to leave for foreign lands, who would then be able to boast of him and become the envy of the rest of Europe”27. In the mid-nineteenth century, the ruling sovereigns of Europe endeavoured to secure the services of the very best instrumentalists as their court soloists. One of the most prestigious posts was soloist at the St. Petersburg court, a capital which played an extremely important role in the musical life of Europe. Previous holders of this post included the violinists Henri Vieuxtemps and Apolinary Kątski28. Wieniawski crossed the River Neva with the express purpose of securing this position, the ground-work for which had already been prepared by his influential friend Anton Rubinstein. On 25 April 1860 General Saburov, the Director of the Imperial Theatres, approached Count Adlerberg, the court minister, with the proposal that Wieniawski be appointed court-soloist. Just four days later Wieniawski received news of the Tsar’s agreement, and the very next day the Polish artist signed a three-year contract (which was subsequently to be renewed twice, making nine years in all). Now the final obstacles blocking Wieniawski’s marriage had been removed. But before the marriage could take place Wieniawski had three concerts to give in Vilnius, then at the end of May he was obliged to spend a few weeks in Warsaw where he had not played for ten whole years. Wieniawski’s concerts in Warsaw aroused unprecedented enthusiasm from his audiences and high praise from the critics. The most famous of whom, Józef Sikorski, wrote in the journal, Ruch Muzyczny („The Musical Moveent”): Mark my words: if you live to see it, you will witness this violinist become the stuff of legend just like Tartini and Paganini”29. From Warsaw Wieniawski went on to Paris, where on 8 August he married Isabella Hampton at the Church of St. Andrew. Anton Rubinstein led the bride to the altar, Gioacchino Rossini was a witness and Henri Vieuxtemps played the violin during the ceremony. The newly-weds then travelled from Paris to London to receive the blessing of Isabella’s parents, and then went on to Lublin to see Henryk’s parents. Then, passing through Warsaw, where they bade farewell to their friends, they set off for their new destination – St. Petersburg. Wieniawski’s duties in his new job involved performing in court concerts, playing the solo parts in opera and ballet productions at the Bolshoi Theatre and teaching violin at the Theatre school. His contract authorized him to stage his own concerts annually, at his own expense, in the grand theatres of St. Petersburg and Moscow – an entitlement that Wieniawski interpreted liberally since he often managed to arrange himself extra concerts. He also collaborated closely with the Russian Musical Society, whose founder and director was Anton Rubinstein, and he took part in many of their concerts. Wieniawski formed and led a string quartet attached to the Society and each autumn and winter it gave a cycle of chamber music concerts. The illustrious line-up of the players and their brilliant artistry and repertoire met with great interest and acclaim. In St. Petersburg Wieniawski had the chance to exploit the wealth of musical experience that he had gained in London. Many of the chamber works that he had played in London now appeared in the programmes of his St. Petersburg concerts. He also introduced some new pieces, e.g. L. v. Beethoven’s Piano Trio in D major, op. 70 no. 1 and the String Quartets in C major op. 59 no. 3, F minor op. 95 and C sharp minor op. 131; G. F. Handel’s String Quartets: in D minor, B flat major and F major; F. Mendelssohn’s String Quartet in E flat major op. 12; W. A. Mozart’s String Quartet in D minor and String Quintet in G minor; R. Schumann’s Piano Trio in F major. The programmes of these concerts also included compositions by Russian composers: Nikolay Afanasyev’s Volga String Quartet and A. Rubinstein’s Piano Trios op. 62 and op. 19, plus his Quartet in C major op. 66. Wieniawski also introduced new works into his repertoire for the programmes of his chamber concerts, court concerts and other concerts organized by the Russian Musical Society: H. Vieuxtemps’ Violin Concerto in A minor no. 5; L. Spohr’s Violin Concerto ‘In modo di scena cantante’ no. 8; A. Rubinstein’s Violin Concerto in G major op. 46; the Chaconne from J. S. Bach’s Second Partita in D minor; H. Berlioz’ Ręverie et caprice op. 8 and R. Kreutzer’s Romance. It was during his years of employment at the St.Petersburg court that Wieniawski composed his most mature works. Here, for the teaching purposes, he wrote eight virtuoso miniatures – the Etudes-Caprices for two violins op. 18. Two of his most beautiful miniatures are the Obertas30 and Dudziarz (The Bagpiper) published under the joint title of Deux mazourkas caractéristiques op. 19. In 1865 he wrote the popular Fantaisie brillante on themes from Ch. Gounod’s Faust op. 20; and five years later he composed the Polonaise in A major op. 21. In St. Petersburg Wieniawski also wrote a transcription of A. Rubinstein’s Romance entitled The Night; his only viola piece, a Ręverie dedicated to Hieronim Weickmann, his partner in the Quartet (the piece was completed by Weickmann in 1885 after the composer’s death) and cadenzas to violin concertos by Viotti and Ernst. The crowning glory of this period of composition was Wieniawski’s Second Violin Concerto in D minor op. 22. Its first version had been written in 1862 but the subsequent improved concerto was published in its final version in 1870. In St. Petersburg Wieniawski took an extremely active part in high society gatherings held in the salons of musicians and patrons of the arts; these salons played a significant role in nineteenth-century Russian musical life. When in 1862 Anton Rubinstein established Russia’s very first Music Conservatoire, Wieniawski collaborated closely with his colleague in drawing up the Conservatoire’s organizational framework and programme of study. He joined the board of directors and taught the violin and chamber-music class, a position which he held until 1867. Wieniawski’s St. Petersburg contract restricted his freedom to make music, a freedom on which he greatly depended. So it was with extra fervour that he used the summer vacations to develop his concert career. Moreover, with each new contract the vacations became longer and longer, eventually amounting to a whole six months. Since discipline was not one of Wieniawski’s virtues, by exploiting the forebearance of the Tsar’s functionaries (who had a soft spot for him), Wieniawski sometimes avoided appearing in St. Petersburg for many months at a time. As a matter of fact, out of the twelve years that he was formally employed in St. Petersburg, Wieniawski spent no more than half of the time in the city. London was a frequent stop on Wieniawski’s vacation travels and he gave concerts there in 1861, 1864, and annually between 1866-1869. He took part in the Monday Popular Concerts, the matinées of The Musical Union, the famous Promenade Concerts at Covent Garden, and various Philharmonic and private concerts. In 1863 and 1867 he played in numerous concerts organized throughout Holland. In 1862 he appeared at the Hôtel Lambert in Paris in a charity concert in aid of destitute Poles resident in the French capital. Five years later he gave two series of concerts in Paris interspersed with appearances in Bordeaux. In 1863, 1867, 1870 and 1871 he was welcomed by the music-lovers of Denmark, Sweden, Norway and Finland. Almost every year he took part in the musical gatherings of leading artists in the health-resorts of Baden-Baden, Wiesbaden, Kreuznach, Ems and Ostend. In 1866 and 1869 he gave concerts in Bucharest. In 1869 he gave an extraordinary concert in Constantinople to an audience of a single person: Sultan Abdul-Aziz. Wieniawski gave concerts in many German towns, but did not miss out Russian towns on his summer travels. In 1870, after an absence of ten years, he re-appeared in Warsaw. The three concerts that he gave there prompted critics to analize the changes that had taken place in his style of playing – changes which critics in other countries had already described. These were most pertinently summarized in a review by the Warsaw critic, teacher, pianist and composer – Jan Kleczyński: „For those who heard Mr Wieniawski ten years ago, his present playing came as the revelation of a completely new artist. Formerly Mr Wieniawski’s playing presented itself as a stormy, troubled ocean wave, today his playing is calm and clear as a lake. By no account does this mean that his playing is devoid of emotion; quite the reverse: it brims over with expression, though this is not as fiery as before. If there are places in which one laments the passing of the storm, then there are other places in which one is enchanted by the charms and the poetry which radiate naturally and effortlessly from Mr Wieniawski’s playing”31. Two years later Wieniawski returned to Warsaw to honour an invitation issued several months earlier in St. Petersburg by the Tsar’s governor in Warsaw, Fyodor Berg. When Wieniawski visited Berg in Warsaw, to invite him to the concert, the Governor had clearly forgotten about the agreement reached in St. Petersburg and arrogantly dispatched the artist. This met with an ironic retort from Wieniawski. A huge row broke out and Wieniawski was expelled from Warsaw. This incident was generally believed to be the reason for Wieniawski’s application to leave his St. Petersburg employment. In fact, the row was actually a convenient excuse to implement a decision which had been brewing in Wieniawski’s mind for some time. He had become excessively encumbered by the restrictions imposed by his court appointment and had even been discussing the possibility of undertaking an extensive tour of America. The row with Berg made it easier to make the break. After his expulsion from Warsaw, Wieniawski still had concerts to give in Revel, Helsinki and Viborg, after which he went to St. Petersburg and with a concert on 21 June 1872 bade farewell to the city’s music-lovers. Six days later he left Russia. The impressario Maurice Grau was in the process of organizing a group of artists for an American tour. He had already engaged Anton Rubinstein as his star soloist and he now added Henryk Wieniawski to join him. The singers Luisa Liebhard and Luisa Ormeni made up the team. On 31 August 1872 they set sail from Liverpool to New York and on 23 September began a marathon, murderous tour. An American chronicler wrote that Wieniawski’s late entry into the tour meant that it was organized under the headline of ‘Rubinstein Concerts’. The mechanism for establishing oneself as a star in America was not easy. A huge amount of resources had already gone into advertising the Russian pianist, and posters had been printed with Rubinstein’s name prominently displayed. After much hesitation, Wieniawski accepted the impressario’s conditions32. Great was the surprise of the audience and critics when it turned out that the violinist appearing alongside Rubinstein was his equal partner – at least. Wieniawski’s profound artistry was soon recognized. He fascinated audiences with his playing. A critic wrote in „Dwight’s Journal of Music”: „In Henri Wieniawski we were listening to one of the world’s g r e a t e s t violinists. To hear Mendelssohn’s perfect Concerto in E minor played by such a master was a delight without alloy […]. We did not understand why Wieniawski was announced as the only rival to the memory of Paganini, or why he should be placed in such a category. The art which he revealed to us on Monday evening is something of a far nobler, purer character than we have ever associated with the Italian ‘Wizard of the G string,’ whose gift was so sensational and so contagious, bewitching younger aspirants into a questionable devotion to the mere tricks of the violin. But here we had classical violin playing in its purity, applied to one of the worthiest and most arduous tasks. Often as we have heard that Concerto played well, we never realized the half of its full beauty until now”33. A reviewer from the „New York Herald” added: „We have had no such finished artist on the violin since the days of Paganini”34. Other American critics spoke in similar tones. One went so far as to say that Wieniawski was received „as the brilliant and welcome light that brightened up the too often dreary programmes of the Rubinstein concerts”35. In the course of eight months they were to give 215 concerts in 60 cities of the eastern States. Rubinstein was physically and mentally broken by this tyranny of six to seven concerts per week. Wieniawski, on the other hand, stayed on a whole extra year of his own, giving concerts in California, in other western, States and in Mexico. He was particularly warmly received in California. To show his gratitude to the Californian audiences he wrote and dedicated them a new composition – Souvenir de San Francisco, based on American song motifs. The Hague biography of Wieniawski was followed by a second biography in eight chapters; this book is known only from press accounts and has been sought in vain. Wieniawski then returned to New York for a few concerts and on his way back to Europe appeared in Cuba. His repertoire expanded to include the following pieces: J. S. Bach’s Sonata in E major; L. v. Beethoven’s Sonata in A major op. 62; E. Grieg’s First Sonata; J. S. Bach’s Adagio and Fugue in G minor; H. W. Ernst’s Airs hongroises, F. Schubert’s Rondo Brillant and Piano Trio in B flat minor; H. Vieuxtemps’ Ręverie; the Duet from ‘William Tell’ by Ch. Bériot and A. Osborne. In the summer of 1874 Wieniawski was back in London where he immediately threw himself into concert-life. He took part in the Covent Garden Promenade Concerts and evenings of classical music. In September and October he gave concerts in Holland, and at the invitation of the Dutch king spent several days at the royal summer residence in Loo. On his return to the British Isles Wieniawski appeared in Liverpool, Manchester and Dublin. On 1 December 1874 he travelled with his family to Brussels where the family set up their permanent home. In the previous year during his trip to America, Wieniawski had received an invitation from the Director of the Brussels Conservatoire, François Auguste Gevaert, to take over the job of Professor of the Violin Class from Henri Vieuxtemps who was afflicted by paralysis of the arms. In the spring of 1874 Vieuxtemps’ health improved sufficiently for him to resume his duties and he was encouraged to do so by the Directors of the Conservatoire and by the ruling powers. But Vieuxtemps declined the invitation and moved to Paris. It was only then that Wieniawski agreed to take over his friend’s professorship which had now expanded to included a chamber-music class. He assumed these duties on 28 December 1874. Just as in St. Petersburg, so in Brussels Wieniawski’s irrepressible passion for concert-giving proved itself hard to reconcile with a systematic teaching schedule. Wieniawski gave concerts not only in Brussels, where he set up an especially valuable new series of chamber concerts with the pianist Louis Brassin: the Union Instrumentale, which was successfully based on the London chamber-music concerts. Wieniawski also gave concerts in other Belgian cities, made many trips to Paris to play, was a frequent visitor to the concert-platforms of the Hague, Amsterdam, Utrecht and other Dutch towns. At the turn of 1876 he toured Germany, appearing in Kassel, Barmen, Hamburg, Hannover, Bremen, Magdeburg, Frankfurt, Güstrov and Schwerin. In January 1876 he went to Warsaw for three concerts, and in the same year gave several concerts in London and Manchester. The teaching methods that Wieniawski brought from St. Petersburg were highly valued in Brussels. These involved giving his students frequent opportunities for public performance and ensemble music-making. An example of the high regard in which Wieniawski was held is shown by King Leopold II’s bestowal upon him of an important decoration. Wieniawski’s violin class contained mostly foreign students (who were possibly more talented than the Belgian pupils) and he gave these special attention. This did not endear him to a section of the Belgian press. One of the gifted foreign students was young Leopold Lichtenberg, whose great talent Wieniawski had uncovered during his American tour and whom he now brought to Brussels. Lichtenberg did not disappoint his professor and in his final exams he gained First Prize with distinction. The laureates of this competitive examination included other of Wieniawski’s pupils. The famous Belgian violinist Eugène Ysaÿe was one of Wieniawski’s private pupils in Brussels. Meanwhile, Wieniawski was receiving disturbing news from Brussels concerning the future of his professorship. He wrote back from Sweden to the Director of the Conservatoire, François Auguste Gevaert, asking to be dismissed. After attempts at persuading him to stay, the request was granted on 27 September 1877 by a decree of King Leopold II. Wieniawski continued to travel in Europe. August 1877 saw him giving two concerts in Geneva, then in Lausanne and Montreux. There followed a further series of concerts in Germany: Baden-Baden, Bad Homburg, Frankfurt-am-Main, Wiesbaden, Leipzig... Here Wieniawski’s deteriorating heart condition flared up. A critic from the „Musikalische Wochenblatt” related: „The audience welcomed their dear friend Mr Henryk Wieniawski as soloist, and he drew from his magical violin such exquisite sounds that it was hard to believe that the same person who played Mendelssohn’s Concerto with such bewitching intensity, youthful freshness and distinguished virtuosity has been afflicted for over a year by grave physical suffering”37. Despite his agonizing illness Wieniawski set off for Scandinavia with a group organized by the impressario Ullman for a further tour of Oslo, Copenhagen, Stockholm and other cities. Wieniawski then appeared with the same group in Germany: Hamburg, Lübeck, Kiel, Cologne, Koblenz, Hannover, Berlin, Dresden, Frankfurt-am-Main, Stuttgart, Münich, and Breslau.